The main tower keep of Himeji Castle. In between my visits to Okinawa, Kyushu, and Tokyo this past summer, before landing in Kyoto for the final week, I took the opportunity to make use of my JR Pass to visit a few other places, including Himeji Castle, Ise, a Tokaido post-station known as Futagawa-juku, and … So, before I get to finally talking about Kyoto (and then finally moving on from my summer 2018 Japan trip), this blog post is going to be a little scattered. 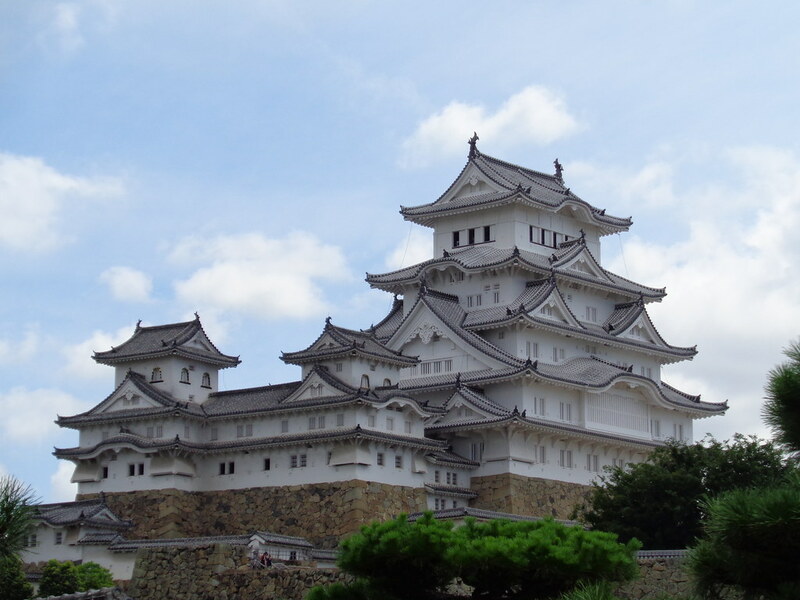 Himeji is of course one of the largest, most famous, castles in Japan, and one of only a few to actually date from the Edo period and not be largely/entirely 20th century reconstructions. But, as it’s a short ways west of Kobe, and not located within a major city, I had never gotten around to visiting it before. It’s certainly a cool thing to get to see, and with great history. The Sakai family lords of Himeji were interesting folks, including some very prominent and influential figures within the Tokugawa shogunate government, as well as figures like Sakai Hôitsu, son of one of the lords of Himeji, who never gained any political prominence or power but is surely among the greatest painters of the Edo period. I also very recently learned that several of the Sakai lords were real pioneers in patronizing Ming (Chinese) music in Japan. And, as I learned upon visiting the castle, Princess Sen (or Senhime), a daughter of Tokugawa Hidetada and wife of Toyotomi Hideyori, once lived there. Stories about her thus dominated much of the labels and descriptions within the castle. Inside the main keep at Himeji castle. I only wrote a very few thoughts/reactions about the castle at the time. But, one thing that struck me was the way they did it up as a history of the castle vs. as a history of the domain more broadly. It’s funny… When visiting for example Fukuyama Castle (near Hiroshima), as well as Hiroshima castle, both of those pretty much just use the castle as a space to tell a much broader history of the domain, and of the successive lords of that domain. In both Fukuyama and Hiroshima castles, which were just chock full of artifacts, paintings, documents, displayed as museum exhibits, I felt it was a shame that we couldn’t really get a sense of it as a castle. I wished they’d done it up more like a historical house recreation. And yet, at Himeji, the first half of what I visited, the tenshu (main keep) has no objects on display at all, and is almost exclusively about appreciating and experiencing the space itself, the architecture, and the way the space was used at the time (primarily for storing weapons, and as a guard tower, from which warriors could defend the castle, or something like that). It’s only in the second half of the site (a different, nearby building) that you learn about Senhime, and her life there. But even then, I was wishing there were more teaching us about the Sakai family, from Sakai Tadahiro to Tadazumi to… whomever. But I guess you can’t have it both ways. Of course, this castle also is mostly just empty rooms, and not anything approaching a recreation of what it would have actually looked like in use. So, there’s room for going in that direction as well. I would still love to see any of these historic castles done up a little bit more to really show not just the rooms, but the furniture, etc. 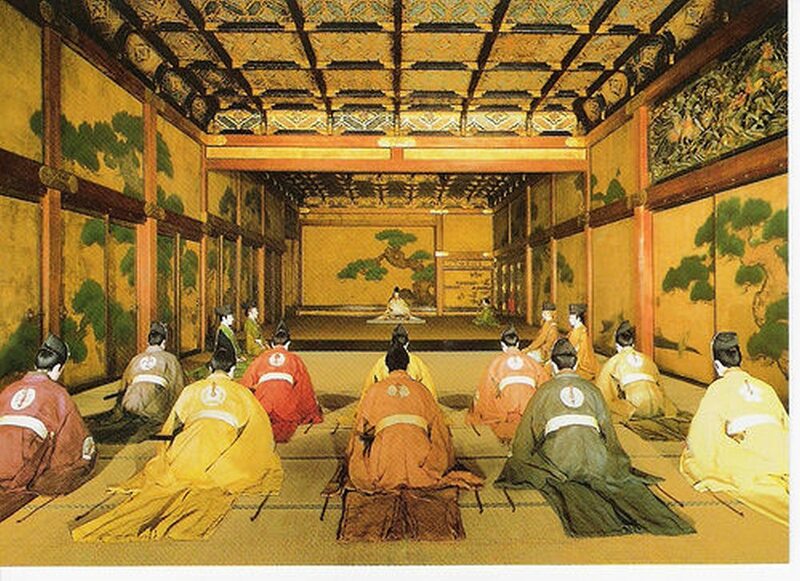 The Great Audience Hall (Ôhiroma) at Nijô castle in Kyoto. Nijô castle in Kyoto does that to a certain extent. The Ôhiroma, or Great Audience Hall, at Nijô has mannequins arranged to show you how lords would have gathered before the shogun, and that I really appreciate. Really does just so much to show you how these rooms were used, rather than giving you an empty room and asking you to imagine. But even at Nijô, most of the other rooms are still left empty. The small temple of Dairin-ji, in the Furuichi neighborhood of Ise. And, just to one side of the main temple building, the graves of Magofuku Itsuki and his lover Okon, the inspiration for the Kabuki characters Fukuoka Mitsugi and Okon. On my way from Himeji to Nagoya, I stopped in Ise. As you do. Actually, for anyone reading this and planning your own trips, note that actually Ise is rather out of the way. You can take the Shinkansen (bullet train) straight from Himeji to Nagoya; Ise is not strictly-speaking along the way. Only local trains and not bullet trains go there. As I wrote in a series of blog posts quite a few years ago, Ise was historically not only the site of one of the most important Shinto shrines in Japan, but as a pilgrimage destination it also developed in the Edo period a very notable neighborhood of inns, theaters, brothels, etc. There is very little left to see today of the Ise Furuichi (“old market”) neighborhood, but even so I was very much curious to see it, as Ise Ondo Koi no Netaba, the kabuki play I took part in during my time in Hawaii, was set there. So, I visited the Buddhist temple Dairin-ji, mentioned very briefly but never seen in the play, where Manjirô escapes to briefly, so as to not be seen by… I forget, who, actually. And, perhaps more importantly, the real individuals who served as the basis / inspiration for the main characters of the play are buried there. It was kind of funny trying to find the temple. I’m not sure exactly what I expected. Well, I expected that the temple grounds might be even just a little bit larger than they turned out to be, and in particular, I expected that there would be some kind of traditional wooden gate. I don’t know why, but somehow I had in my mind an image of the big wooden gate to Dairin-ji, and that that would be where I might take a photo. As it turns out, there is no gate. Not even a modern one. Just a single main temple building (and a few smaller more modern ones attached to it), immediately facing (or, depending on how you look at it, situated within) a small parking lot, and then to the side of that, an extremely small graveyard, no more than 10 or 15 gravestones. And, a stone marker indicating the name of the temple. That was it. I’m glad I went, glad I saw it, but there was really nothing at all to see other than to take a couple of photos and move on. Sadly, I arrived too late in the day to see the Ise Furuichi local history museum. So, I do wonder what that might be like. For all I know, it might surprise me. Might be quite nice and newly-maintained, like the ones at Futagawa and Tomonoura. Maybe all that I expected to find at the temple might be satisfied at the museum. But, yeah, sadly, I didn’t get to see that. 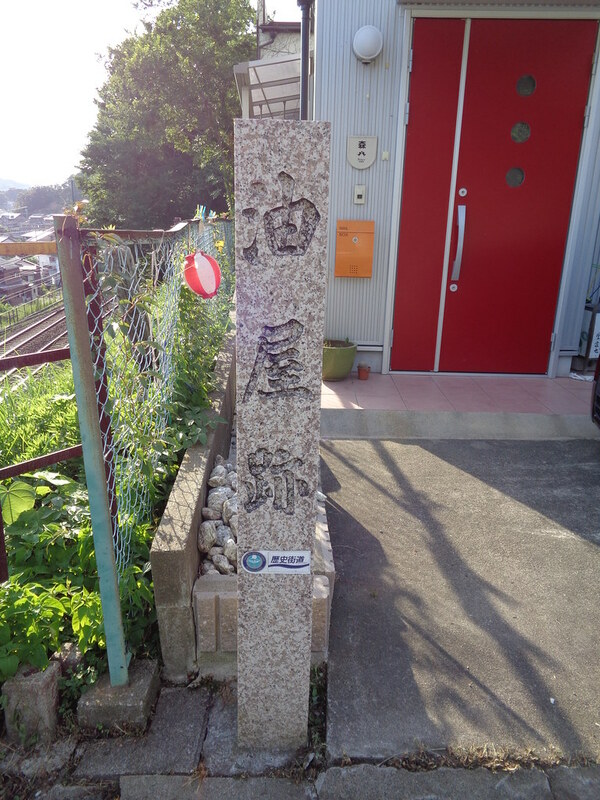 Fortunately, however, just as I was despairing at having come all that way just to see so little, I came upon a small stone marker (right) indicating the former site of the Abura-ya, the brothel where nearly the entire play takes place. Actually, it’s funny – I opened up Google Maps to search for it, to search for where it might be, and then noticed it was actually right there right in front of me. Haha. Wow. Not that this was much either – it truly is simply nothing but a stone marker. But, even so, as something I’d hoped to see for years, I was glad to not leave without spotting it. Of course, I didn’t leave Ise without visiting the shrine. But, to be honest, and I’m sorry if any of my Religious Studies friends take offense or something, but after having visited Meiji Shrine, Atsuta Shrine, and some other such places that also involve very long walks through wooded paths before you finally actually get to the sacred center, I kind of felt like I’d seen and done that before. And since, of course, at Ise you’re forced to remain at a certain distance from that sacred center, and can’t go in further past a certain point, well, that was about it. Even the closest point you can go, the one place where there really is something (anything) worth taking a photo of, is the one place where you’re not allowed to do so, and they have a pretty serious-looking security guy from the Imperial Household Agency (or something? I forget) watching to make sure you don’t take photos. So, *shrug* that was that. If I’d had more time, I might have enjoyed the touristy shopping street just outside the shrine, get a little more of a feeling of having actually experienced something by coming all the way out there, but, oh well. I’m sure I’ll be back, eventually. Maybe in 2033 when they rebuild the shrine over again, haha. From Ise, I then made my way to Nagoya. 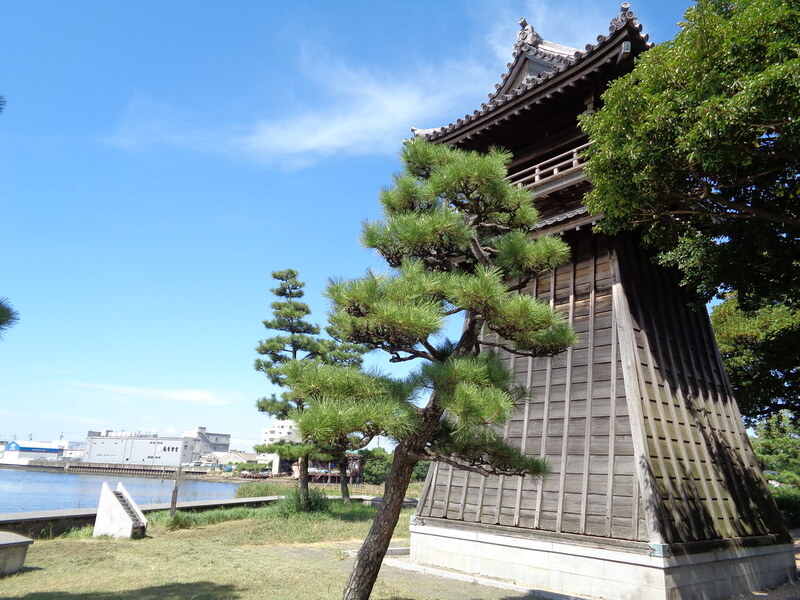 I’d been to Nagoya before, and had seen all the really major sites – Nagoya castle, Atsuta Jingû – so this time, while I had just a day or so, I made sure to poke out to some more minor, but interesting, sites related to the Ryukyuan embassies to Edo. Since Atsuta Shrine was a major destination, it was also a stop on the Tôkaidô. 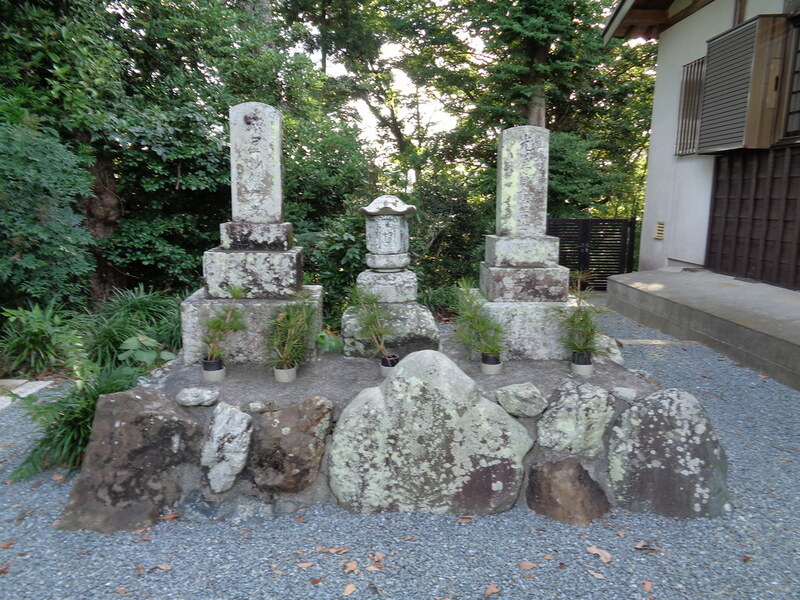 Just a few blocks away from the shrine, though there’s nearly nothing to see of it today, is a small parking lot and a stone marker marking where the Red Honjin, the main elite lodgings at this Miya-juku (lit. “shrine post-station”) once stood. 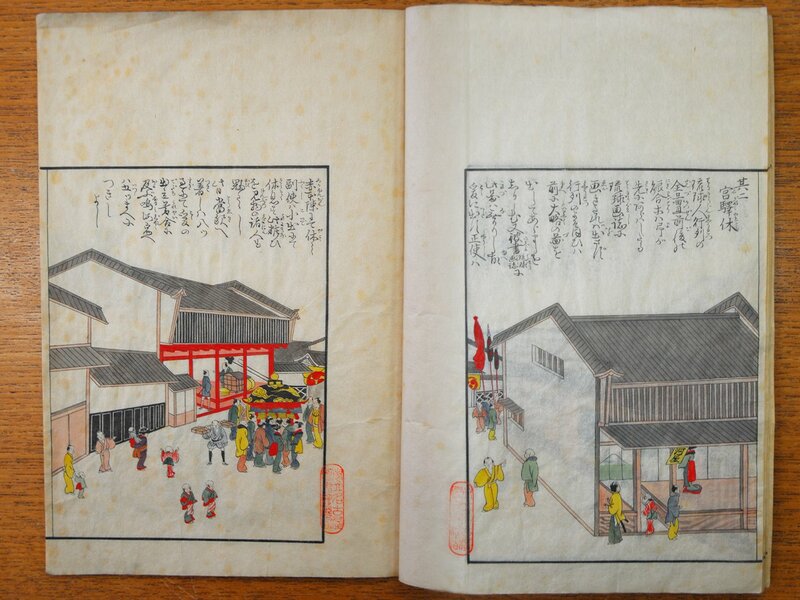 The honjin can be seen in an 1832 illustrated book known as Meiyô kenbun zue, which I’ve quite enjoyed using for my research. 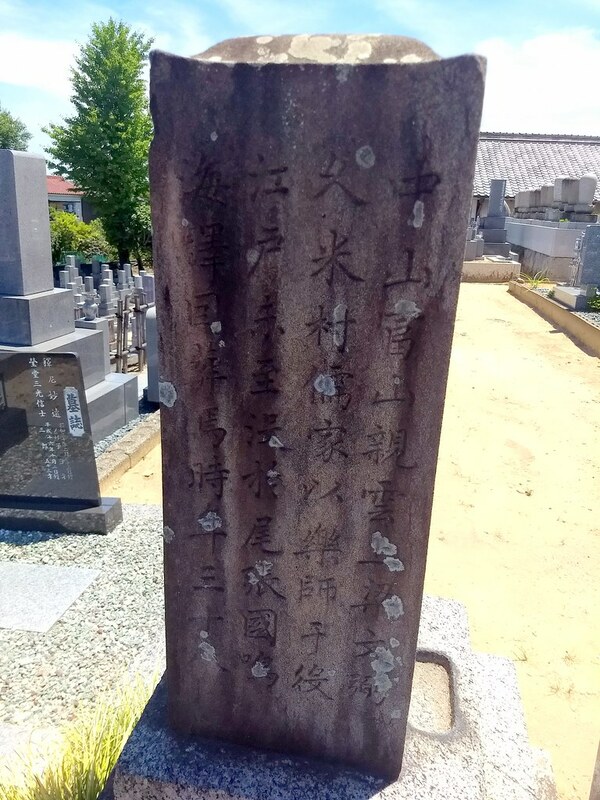 Above right: A gravestone at Zuisen-ji in Nagoya, for Tomiyama peechin Ryô Bunhitsu, musician who died on the 1832 embassy. The inscription reads 「中山富山親雲上梁文弼久米村儒家以楽師于後江戸来至没於尾張国鳴海駅回葬馬時午三十八」(roughly, “Tomiyama peechin Ryô Bunhitsu of Chûzan [i.e. Ryûkyû], master musician and Confucian scholar of Kumemura, later traveled to Edo and died at Narumi station in Owari province [i.e. Nagoya] … [and then a part I don’t quite understand; he died at age] 38.). Also quite nearby is Shichiri-no-watashi, the former site of a boat dock where people used to arrive and depart for the crossing across Ise Bay to Kuwana. A Ryukyuan mission was nearly lost in a storm on this crossing in 1671, and so from then on (with one exception), they took an overland route. 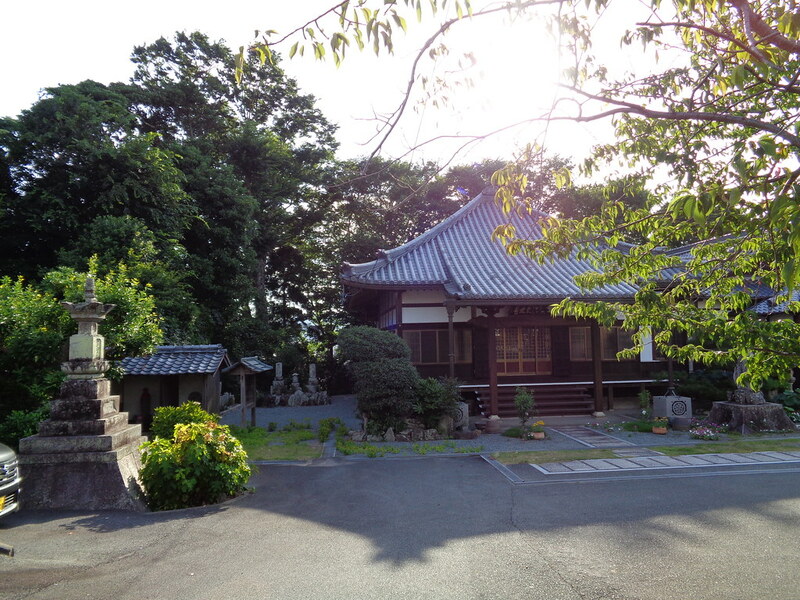 Finally, I also visited the really small and slightly out-of-the-way temples of Kaikoku-ji and Zuisen-ji, where Tokashiki peechin Shinfu Ma Gen’ei (a member of the 1748 mission) and Tomiyama peechin Ryô Bunhitsu (a master musician on the 1832 Ryukyuan mission to Edo), respectively, are buried after dying of illness on the journey. Sadly, this was not entirely uncommon; the almost complete separation of Japanese and Ryukyuan populations, combined with the Ryukyuan lack of experience with cold weather, were likely key contributing factors, and a number of members of embassies to Edo caught Ryûkyû no kaze (the Ryukyuan cold, or Ryukyuan flu) and died. Many Japanese fell ill, however, too, whenever Ryukyuan embassies passed through their towns, so Ryûkyû no kaze went the other way as well. A guardtower at Shichiri-no-watashi, at what is today known as Miya-no-watashi Park 宮の渡し公園. I wish I might have visited the corresponding site at Kuwana on the other side of Ise Bay, but there was no time. The entrance of the main honjin at Futagawa-juku, as seen from inside the building, looking out towards the street. I then sped to Tokyo to meet up with some professors, and a day or so later took the Shinkansen out to Toyohashi City, Aichi prefecture (which was a fair bit farther from Tokyo than I’d thought), to visit the honjin museum at Futagawa-juku. Futagawa was one of 53 official “stations” along the Tôkaidô, the chief highway connecting Edo (Tokyo) and Kyoto. When daimyô (samurai lords), Ryukyuan or Korean embassies, imperial envoys, or certain others passed through such post-stations, they were often provided lodgings at a honjin – a special inn set aside for such elites, that was usually larger, nicer, better than the other inns, and that often included certain special amenities for precisely that purpose, such as a small area with a raised floor, so that the lord could literally sit above his retainers when he met with them. These honjin often served as lodgings for only a portion of the time, and often doubled as the home and/or main “office” so to speak of the town headman. Getting to the point, the honjin at Futagawa is one of only a very few that are still intact, and that are maintained as a museum. I wasn’t quite sure what to expect from such a small local history museum, but I was certainly not disappointed. Quite to the contrary, I was pleasantly surprised and impressed. All along the main stretch in Futagawa, along the old Tōkaidō, nearly every house and shop has the same blue Futagawa-juku noren (curtain) hanging outside. Makes me curious, if people really feel a strong connection and pride in the history or whether it has more to do with community, or how exactly they (and we) might characterize it. The honjin itself is huge. I guess I’m not surprised, it totally makes sense that for an inn worthy of a daimyo, and one that can house 30-40 of his followers, it would be such a size. And of course not all honjin were this big; they varied, and we can look that up. But to see it first-hand, experience the number of rooms, is something. A much different experience from simply reading about their size or capacity, or looking at illustrations or diagrams. And the Museum itself, housed in a neighboring building, was surprisingly large, too, with two floors of exhibits. Awesome of them to allow photos too. 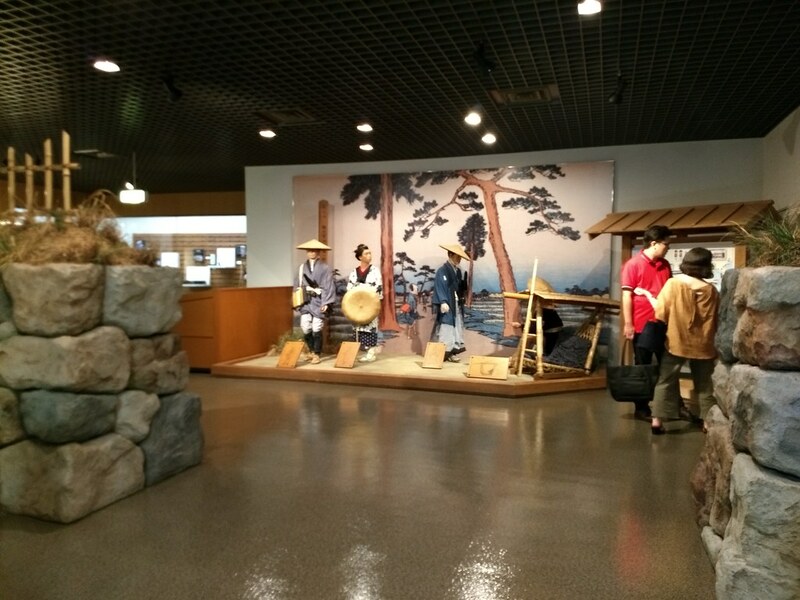 The beginning of the second floor exhibits at the Futagawa-juku Museum, showing travelers on the Tôkaidô. Plus, the curator, Wada Minoru, was so kind. He not only came out and helped show me exactly which publications listed the relevant documents, but he even was willing to go and get them and let me see them immediately. If he had said you have to make an appointment, I would have totally understood. But he was willing to take the time to let me look at them immediately. Amazing. Of course, who knows how useful they’ll be especially since I really don’t have the time to actually read them. But… Maybe just by having them in my HD, I’ll gain something by osmosis or something, haha. I know I’ll never work for such a small local history museum; unless I end up doing some kind of research on the museum itself, I don’t see how (why) I would ever find myself actually spending more than a couple of days there. Which is sort of a shame, really – considering that they actually seem to have a pretty great operation at the Futagawa-juku Honjin Museum. The exhibits are very nice, they publish a lot of good catalogs … The local museum at Tomonoura is perhaps similar, but even so their exhibits were still not as extensive as those at Futagawa. I feel like it would be really great to get to know some of these museums, and their surrounding communities, a bit better. Someday. Somehow. At the very least, I do want to go back to Futagawa someday, if only to visit the small local history museum at the Arai sekisho (checkpoint) a couple train stops away, and Hamamatsu (Okitsu) and Sunpu (Shizuoka), where there are a few more Ryukyu-related sites to be seen. For now, though, this past summer, I simply went back to Tokyo, finished up my business there, and then headed to Kyoto for the remainder of my summer sojourn. Two years ago, I was honored to play a small role in a Hawaii Kabuki production, The Vengeful Sword, and to serve as dramaturg. This involved doing research on a variety of elements that come up in the play – including the historical events that inspired the play, the history of the locations, the meaning of certain terms – and sharing the results of my research with the cast & crew via a private (closed) blog. I’ve posted before, on numerous occasions, about the production, but now, I’m finally getting around to re-posting, publicly, some of that content. I hope you find it interesting. What about The Vengeful Sword itself, our MacGuffin, the eponymous Aoe Shimosaka? The design to the left, a “three-leafed aoi” design, or something very much like it, is i would guess imprinted on the blade of Manjiro’s heirloom sword, near the handguard (tsuba). It is either this, the swordsmith’s signature, or some other inscription, that Mitsugi is looking for as he pulls each sword out of its sheath and looks at it under the lantern light. ‘Aoi’ (葵 or 蒼) is often translated as ‘hollyhock,’ but is in fact a different plant. In any case, its leaves are commonly used in samurai crests and other such symbols. If you are familiar with the Noh, and/or the Tale of Genji, this is the same ‘aoi’ as the Noh play (and Genji chapter) Aoi no Ue or “Lady Aoi,” which centers on a woman known by that name. It is called “Aoe” with an ‘e’ in the Stanleigh Jones translation, and rendered as 青江 (blue/green river/inlet) in the Japanese, as this was the crest of the Tokugawa clan, and the authorities in the Edo period were not fond of references to the shogun (or his family crest) in kabuki, ukiyo-e prints, or other forms of popular culture. Shimosaka refers to the swordsmith. Yasutsugu I, or Shodai Yasutsugu, also known as Shimosaka Ichizaemon, was himself the son of a swordsmith as well, but began a new lineage. Born in a place called Shimosaka c. 1532, he later moved to Echizen province, was granted the title of “Echizen no kami” or Lord of Echizen (note this was just an honorary title and carried no political authority), and was from then on known as “Echizen Shimosaka,” a name he and his disciples (and their disciples) then often inscribed on the blades they produced. Yasutsugu I, the originator of this lineage of swordsmiths, was later in his life granted the honor of using the family crest of the Tokugawa shoguns (seen above), and thus it was that the ‘aoi’ crest came to be found on Shimosaka swords. A kanteisho written in the late 1950s or early 1960s, for a 14th-16th century blade, from the collection of a Col. Hartley, and forged by the swordsmith Shidzu 志津 of Mino province 美濃国. There’s a lot here that I can’t make out, but it does give the name of the swordsmith, his province of origin, the age or date of the sword, and its length, along with the signature of the appraiser and date of the certificate’s creation. The kanteisho for this sword, forged by Fujiwara Hiroyuki of Kyoto (平安城藤原弘幸). This, too, gives the signature and seal of the appraiser – Hosokawa Moritatsu (細川護立), head of The Society for Preservation of Japanese Art Swords (日本美術刀剣保存協会), and, now that I look him up, the 16th head of the Hosokawa samurai family which once ruled Kumamoto Domain on Kyushu. The document is dated 1970, the year Moritatsu died, but while I don’t see any date for the age of the sword on the document, looking up Fujiwara Hiroyuki, we find that this inscription was only used from 1615-1624. Iwaji (who is really Kitaroku) tries to pass off the document as a certificate of authenticity of a protection charm from Konpira Shrine. Konpira, in Sanuki province (which borders Awa), is probably the most famous shrine on the entire island of Shikoku. It is believed to have been founded in the 1st century, making it (along with Ise Shrine) one of the oldest shrines in all of Japan. Incidentally, the Kanamaru-za, the oldest kabuki theatre still in operation, is located quite nearby to Konpira. A paper protection charm from the shrine would look something like this (left), while protective charms (omamori) are more commonly enclosed within (or take the form of) little cloth bags (right). If you’d like one of your own, you can visit a branch of Konpira Shrine at 1239 Olomea Street here in Honolulu. In The Vengeful Sword, the courtesan Oshika claims to have lent the samurai Mitsugi ten gold pieces, or ten ryō in the Japanese. Each “gold piece” would have been a coin called a koban, roughly the size of the palm of your hand, and each worth one ryō. 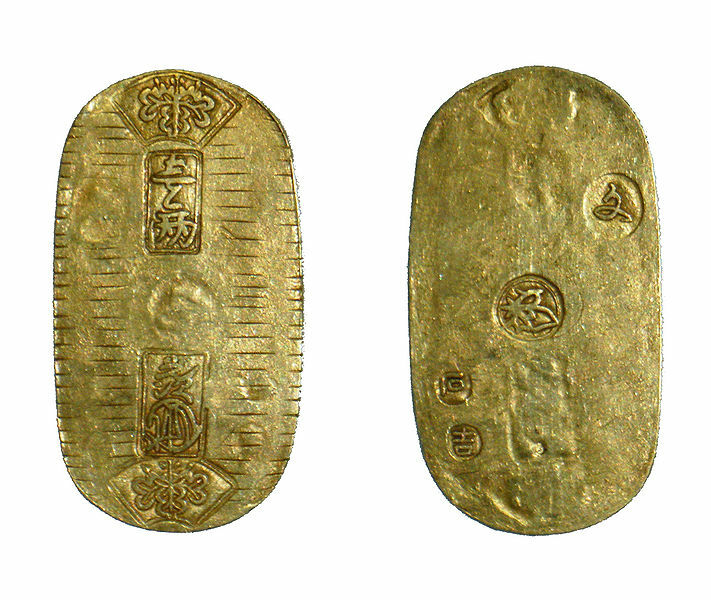 Right: Two koban coins from roughly 1818-1830, each worth one ryō. Each would be roughly the size of the palm of your hand, and perhaps roughly as thick as a quarter. Not pure gold, they would have been roughly 80% gold, 20% silver, the coins having been debased numerous times since the beginning of the Edo period. But how much money was this, really, in terms of value? Oshika talks of selling all her special kimono, and her regular kimono, hair ornaments, all to try to raise this money for Mitsugi. Must be quite a bit of money. Of course, given how expensive kimono could be, how many did she have to sell? This webpage indicates that a men’s ensemble (haori, hakama, and kimono) would have been about one ryô at the cheapest; I’m merely extrapolating, but I’d guess that the much more elaborate, embroidered, and otherwise more fancy kimono of the courtesans would have cost much more. Three ryô each? Five? Still, that doesn’t give us a very good feel for the real value of the ryô. So how much is “ten gold pieces”? Well, it’s hard to say. For much of the 17th century, for the most part, one ryō was, at least in theory, equal to one koku, a set standard measurement of rice said to be equal to the amount needed to sustain a man for a year. But by 1796, when our play takes place, there was considerable inflation, and the coins were debased. One koban no longer contained enough gold to be worth a full ryō in terms of the precious metal it contained, but was one ryō only in face value; furthermore, one ryō was not worth as much as it once was – you couldn’t buy as much with it. As with all currencies, purchasing power, and thus “real value,” fluctuated widely across the Edo period, and so it is impossible to say with any certainty an exchange rate between 1796 ryō and 2011 US dollars. *The salary of kabuki star Ichikawa Danjūrō I (1660-1704) peaked at 800 ryō. *Yoshizawa Ayame I (1663-1729) was the first kabuki actor to attain an annual salary of 1000 ryō. *The Kansei Reforms, in 1794, two years before our play is set, put a cap on kabuki actors’ salaries of 500 ryō. *In 1711, a high-ranking hatamoto (direct retainer to the Shogun, rather than to a provincial daimyo) earned 483 ryō. It’s only a rough estimate, and fairly sloppy, but let us assume for a moment that we can apply this figure of 483 ryō to 1796, eighty years later. If a high-ranking hatamoto is earning less than 500 ryō (and has expenses in excess of his income! ), then this ten gold pieces that Oshika has supposedly given to Mitsugi is fully one fiftieth of what a very high-ranking samurai (or a top-ranking kabuki actor) is earning. Mitsugi himself is only a low-ranking Shrine priest – surely, it’s safe to assume that this ten gold pieces is a rather sizeable sum for him. What is his annual income? Ten ryō? Twenty? Fifty? I can’t imagine it would be above 100, or maybe 150 or 200 at the absolute most. Cecilia Segawa Seigle, in her volume on the Yoshiwara, suggests an arbitrary conversion rate of $450 to one ryō, and suggests that one’s first visit to a major Yoshiwara bordello could cost as much as 10 ryō, including tips to the nakai (serving girls) and taikomochi (men who work in the teahouse) [hey hey! I get tips!]. One website, giving a rundown of typical Edo period prices, costs, and incomes indicates that an officer of the law, i.e. an officer of the magistrate’s office (奉行所同心) earned about 28 ryō a year. Seeing a play at Ryōgoku in Edo cost 32 mon in 1820, or roughly 1/125th of a ryō, at 4000 mon to the ryō. Sending your child to temple school (terakoya) for a year cost up to 1/4 of a ryō, while hiring a maid cost roughly two or three ryō for a year. Buying a small room in Edo (roughly 80 square yards or 66 square meters) was 360 ryō. So, in the end, I am not sure what we can say about quite how much money 10 gold pieces (ten ryō) is to Mitsugi or to Oshika, as we don’t really know their incomes. On the one hand, in terms of income, ten ryô might be a very sizeable portion of Mitsugi’s annual income – anywhere from 1/10th to 1/2 of his total annual funds. But, on the other hand, in terms of prices or costs, ten ryô could just be the price of visiting the Aburaya a few times. I guess it becomes clear that Mitsugi has been living far beyond his means. Even a high-ranking samurai like Manjirô (son of the Chief Counselor to the daimyo of Awa province), whose income is presumably much more than Mitsugi’s, got himself into debt with the teahouse, and had to pawn the precious Aoi Shimosaka sword. So, while we can’t really come up with any particularly definitive answer, let us just suffice it to say that “ten gold pieces” is quite a lot of money. Yes, granted, it is only about the same amount as the cost of a visit to a prominent teahouse in the Yoshiwara, but it is also about four times the total annual salary of a housemaid, one third the total annual salary of a local officer, or 1/50th the total annual salary of a high-ranking shogunal retainer or top-ranking kabuki actor. So, not exactly the kind of money you just throw around. Nor would I want to encourage throwing it around – those gold pieces are large and heavy, and could do some serious damage if you hit someone in the head with them. EDIT: This post, from two years ago, represents only my first tentative effort to dip my toe into this subject. Having looked into it a bit more in the last two years since then, the issue of how much a mon or a ryô is worth, and how much things cost, remains frustratingly elusive and complex. The multitude of currency denominations – not only koban and ôban and ryô and mon, but also momme and bu – along with differences between gold, silver, and copper, and of course the dramatic changes in the strength of the currency over the course of the Edo period, make an understanding of the real purchasing power value of the currency, and of the real ‘cost’ of this or that item, extremely difficult. But, I continue to explore the subject; what little I’ve come up with can be found in an article on Currency on the Samurai-Archives Wiki. During the run of the show, I enjoyed the privilege of delivering a public pre-show talk, sharing some of my research with the audience. I’m posting the content of that talk below. Yes, fallen in love. And I am very excited that during my short time here at UH, I should get to not only see a kabuki production, but to actually play a small part in one. I’m honored as well to get to serve as dramaturg for this show, and just to be involved, alongside such an amazing cast and crew, and to be a part of a now 87-year-old tradition of English-language kabuki at UH. I do not know if I will ever have the chance to be involved in a kabuki production again, and so being here is truly a privilege. To Dr. Iezzi, Kikunobu-sensei, and everyone else, I offer my sincerest gratitude. As dramaturg, I have enjoyed immensely researching various aspects of the early modern Japanese setting of the play – from the history of the town of Furuichi, to the meaning of the name of the titular vengeful sword, to the status and responsibilities of the taikomochi, my own role in the play. I shared what I found with the cast, both through an online blog, and of course in person, hopefully aiding some of my fellow cast members in better understanding their roles, or at least entertaining them with interesting information. Tonight, I take pleasure in sharing some of what I found, with all of you. The Vengeful Sword is a story of a samurai in search of an important missing heirloom sword, and also a story of relationship drama, scheming and intrigues. The play takes place in and around the town of Furuichi, near Ise, the location of the most ancient and most sacred Shinto shrine in Japan. But most of the action takes place at the Abura Teahouse, one of the most famous and popular teahouses in the area. Personally, I much prefer the refined, classy euphemism, but just so we’re clear, when I say “teahouse,” we’re talking about a house of prostitution, a brothel. So, you must be thinking, why are there teahouses in Ise? Isn’t Ise a holy place where people go on sacred pilgrimage? Well, you’re right of course. But, in fact, prostitution in Japan, and presumably in many places around the world, got its start at rural inns along major pilgrimage routes. In case you are not familiar with the geography of Japan, you can see Ise as a blue star on this map. It’s sort of in the central-western part of the country, only about an hour and a half from Osaka or Kyoto by train today. You can also see, shaded in red, Awa province, on the island of Shikoku, another place which figures in the play. The town of Furuichi, located on the road which runs between the Inner Shrine and Outer Shrine areas of Ise, though in some respects a rather quiet out-of-the-way village, saw many pilgrims on their way to the Grand Shrine. The town grew, therefore, mainly as a result of the demand from these travelers for places to eat, drink, and stay the night; since it was fairly customary for pilgrims to give in to enjoyments such as alcohol, eating meat, and other pleasures after a long period of abstaining while on pilgrimage, the demand for these things played a major role in Furuichi’s development. By the 1790s, the town of Furuichi boasted 70 prominent teahouses, and roughly 1000 courtesans, that is, prostitutes, ranking third among pleasure districts in the country, after the Yoshiwara in the shogun’s capital of Edo, and the Shimabara in the Imperial capital of Kyoto. 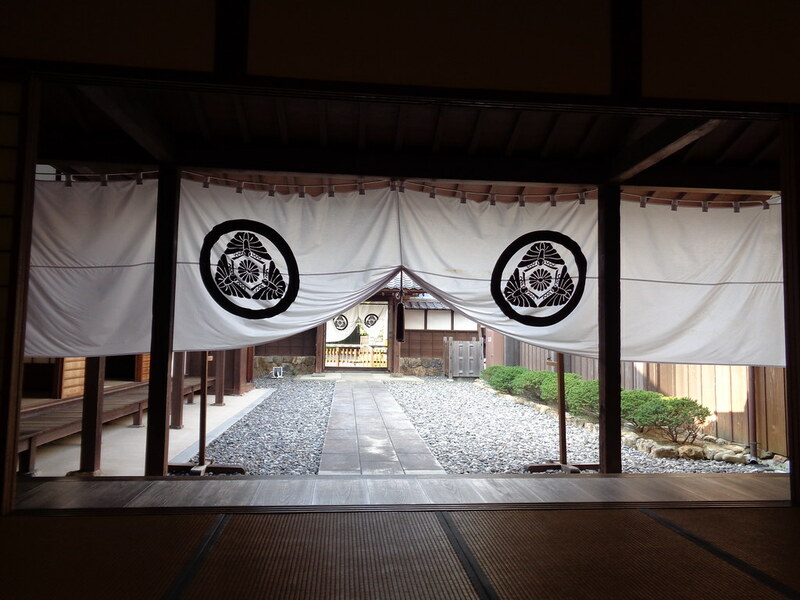 The most prominent teahouses in the district were the multi-storied Bizen-ya, the Sugimoto-ya, and the Abura-ya, where most of tonight’s play takes place. These teahouses were particularly famous for their performances of the Ise Ondo dance, a famous and popular attraction exclusive to the area, after which our play, Ise Ondo Koi no Netaba, is in part named. You will hear the Ise Ondo music throughout the play, and will see several of my beautiful and talented fellow cast members perform the dance later on in the evening. The district also had three or four puppet theatres and three kabuki theatres, along with an establishment called Osugi to Otama, which was famous for its shamisen performances; not simply musical performers, the shamisen players at Osugi to Otama are said to have been especially skilled at dodging coins thrown at them by the audience, or catching them or flicking them away with their bachi (the plectrum with which the shamisen is played). Both kabuki plays and actors often got their starts in Furuichi, before making their debuts in the more major theatres of Kyoto and Osaka. It was often said, “if you can’t make it in Ise, you’ll never tread on the cypress stages of Kyoto and Osaka.” Yoshitsune Senbon Zakura, or “Yoshitsune and the Thousand Cherry Trees,” one of the most famous and popular plays in the entire kabuki repertoire, is among those which was performed first in Furuichi. Kabuki is sadly not so strong today in Ise, but in recent years, there have been revivals of this play, Ise Ondo, and of other pieces, as part of summer festivals in the area. Now, before we return to the subject of the Abura Teahouse itself, let me take a few moments to discuss some prominent items you will see in the play, starting with The Vengeful Sword itself. The Aoi Shimosaka sword, as it is called, is a valuable heirloom which has been in Manjirō’s family for generations. Now, he has been tricked into pawning it and must try to get it back. But what does the name Aoi Shimosaka mean? A little research revealed that it was forged by a swordsmith named Shimosaka Yasutsugu, born sometime around 1532 in a place called Shimosaka. He later moved to Echizen province, which is today Fukui prefecture, and took on the name Echizen Shimosaka, a name that he and his disciples (and their disciples) would then etch into the swords they produced. Yasutsugu I, the originator of this lineage of swordsmiths, was later in his life granted the honor of using the family crest of the Tokugawa shoguns. The crest consists of a design of three leaves from a plant known as aoi, and thus the Aoi Shimosaka sword got its name. You will see in tonight’s play several characters looking intently at the blade, possibly in search of the name “Shimosaka”, or for this three-leafed aoi crest, in order to figure out which sword is the Aoi Shimosaka they are all seeking. Another item central to the plot is the certificate of authenticity, a document that certifies that this sword is indeed the Aoi Shimosaka, and not just another dull blade. Here is a certificate, or kanteisho, for another sword, which I think gives us a sense of what the certificate Mitsugi is searching for looks like. You can see on the right the name of the swordsmith, Heianjo Fujiwara Hiroyuki, which helps us date this blade to sometime between 1615 and 1624, the only period when this name was used. The document also provides the length of the blade, and then ends, at the far left, with the date of the document, and the signature and seal of Hosokawa Moritatsu, the man who drew up this certificate, certifying the authenticity of this sword. There are of course a great many things you will see tonight in the play which I would love to talk about, from kimono to shamisen to hair ornaments and wooden clogs, or geta, but I think I’ll take time to mention just two more, briefly. Here we see Manjiro, with a sort of cloth called a tenugui wrapped around his head. It serves both to protect his lovely hairdo, and to hide his face somewhat as he makes his way to the teahouse. He is worried about his reputation, and is trying to keep it a secret that he frequents the teahouse. The word tenugui means “something to wipe your hands on”, but the cloth only came to be called that later. In the early modern period, such cloths were used primarily for this sort of purpose – covering the head and protecting the hair. Men and women both at this time used oils and wax to hold their hair in place, and some women, such as courtesans, had especially elaborate hairdos that would need to get protected from wind and rain, from low-hanging tree branches, and the like. Tenugui can be worn and used in many ways. In addition to Manjiro hiding his face, you will see one of our lovely hawkers protecting her hairdo with a tenugui. Speaking of the hawkers, they will be out here shortly, before the show begins, selling souvenir Hawaii Kabuki tenugui. All the proceeds go to the disaster relief efforts in Japan, and the hawkers will be happy to show you all kinds of ways you can use the tenugui. Another thing you will see in the play is a number of characters smoking long thin pipes like this one. These are called kiseru. Longer and thinner than the pipes we may be used to in the West, with a smaller bowl, the kiseru was made mainly of bamboo, with metal ends made of bronze, brass, silver, or gold. Contrary to the associations we may draw regarding smoking in China, or the assumptions we may make given the shape of the pipe, this is a tobacco pipe, not an opium pipe. Opium never caught on in Japan, perhaps because of the lack of British access to the country, but tobacco did, following its introduction in the late 16th or early 17th century by the Portuguese or Dutch. And since the Spanish and Portuguese did not smoke pipes at the time, we can assume it was the Dutch who introduced the kiseru. I do not believe that it was particularly popular at the time to smoke privately, nor logistically viable to smoke on the street as we might do today with cigarettes. Rather, smoking was primarily a social activity at the time, something enjoyed alongside saké, food, music or dancing, and conversation within the teahouse. Speaking of which, let us return to the subject of the Abura-ya, perhaps the most famous teahouse in the district. Like other teahouses, the Aburaya would have had multiple rooms for entertaining guests, including smaller rooms towards the back for more important customers who desired greater privacy or discretion, and larger rooms towards the front for larger parties. 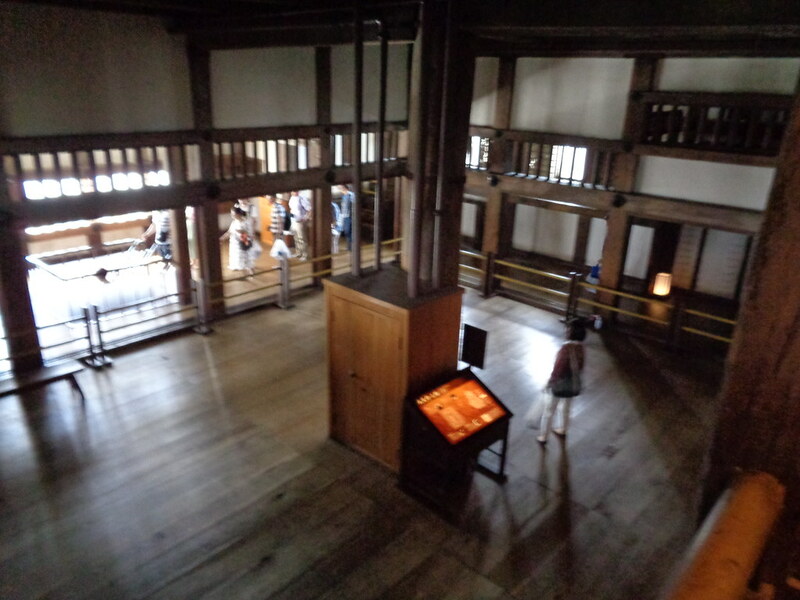 There was also a dance stage, as you can see here, where the Ise Ondo would be performed. In one former teahouse [Actually, a geisha house] which I visited in Japan, which has been turned into a sort of museum or historical house, all the women’s living spaces, the kitchen, storage for kimono and hair ornaments, and the like were on the ground floor, while all the entertaining spaces were upstairs, but I am not sure that this is necessarily how the Abura-ya would have been arranged. Today, the Abura-ya and, arguably, the entire district of Furuichi, is known chiefly for this one play, and for the real-life historical events which inspired it. On a summer night in 1796, a local doctor and regular patron of the Abura-ya, 27-year-old Magofuku Itsuki, quite possibly drunk, or at least drunk, it is said, with jealous rage, pulled his sword inside the teahouse, killing three and injuring six. Little is known about what exactly set him off, what sort of problems or issues he was having, who had angered him or how. But, as is quite often the case in kabuki, simply knowing that such an event occurred was more than enough to inspire a new play, and to serve as the core of its plot. Hearing of these events, and of amateur performances being produced locally in Ise, and knowing how much audiences love this sort of dramatic, action-packed story of jealousy and revenge, some of the top playwrights in Osaka at the time took the story, added various dramatic elements, deceptions and plot twists, and transformed this shocking and tragic event into an exciting and dramatic theatrical production, which then opened in Osaka two and a half months later. Itsuki committed suicide at his uncle’s house two days after the incident, and was buried at the nearby Buddhist temple Dairinji, which you will see is mentioned in the play. Meanwhile, his love, the courtesan Okon, only 16 at the time, survived and lived a relatively long life, dying of illness at the age of 49 and being buried alongside him at Dairinji. You can still visit the grave today, and actors often do, paying their respects before taking on the roles of Mitsugi and Okon. Little remains today of the inns, theatres, and teahouses of Furuichi, except for stone markers indicating their former locations. Nevertheless, I hope this summer to visit, to pay my respects at Dairinji, see the Ise Ondo dances, and perhaps have a meal at the Chinese restaurant that now stands where the Abura-ya once did. I almost cannot believe that this kabuki journey has come to an end. It seems only yesterday that we were down in the Music Building, doing vocal warmups, and just starting to learn how to do all of this. Tonight was the final performance. We still have a post-mortem meeting, to sort of go over what we thought was good and bad about the way training (classes), rehearsals, and the production itself were handled, and then we also have our official cast party at the director’s house. But, for all intents and purposes, today was the last day. Today was the last day we put on our makeup, put on our costumes and our wigs, said our lines, did our scenes. Actually, it’s funny, I’ve known for a long time that today would be the last day for makeup and wigs and costumes, and for seeing the set, and even for being in the building on a regular basis, and all of that – and consciously was aware of these things, at least on some level. But up until I wrote that previous sentence, it hadn’t really occurred to me, or it hadn’t really sunk in, that we wouldn’t be saying our lines, or doing our scenes, again. In a way, that’s really the saddest part, actually. I came to realize in the last few weeks, while doing the actual performances, that, unlike was the case for many of my fellow cast members, for me I don’t think I really enjoyed being on stage so much as I enjoyed being backstage. I mean, that is to say, it’s not like backstage was a rollicking party, but I didn’t really get as much out of being on stage as other people might. For me, it’s not about the acting, it’s about the idea of being involved and not feeling left out (while the show is going on), the idea of having been involved (once it’s over), and the social interactions and close friendships that are borne out of sharing such an experience. Inside jokes, fun stories, and just shared experience. Which is not to say I disliked being on stage. Certainly not. It could be kind of boring at times, and certainly, it was difficult to stay in character and to sit still or move the right way or whatever, to not “break” and crack up at funny bits, all those kinds of things. And sometimes sitting for so long hurt, and sometimes the makeup was uncomfortable, or the wig hurt. But, really, being on stage was not an unpleasant experience at all. It was just, sort of, a neutral experience. Possibly largely due to the role I had, which consisted primarily of sitting and either staring out into the audience, or watching the action around me and reacting in small ways in my facial expressions, in the background. That, and a very brief fight scene. Returning to the point, I guess I surprise myself to realize just now how much I am indeed going to miss saying our lines and doing our scenes, and being our characters. I’ll never again see my friends in that makeup, in those costumes, and all of our scenes, our lines, will be relegated to old stories, to inside jokes, and not to currently living, embodied, identity or experience, if you follow what I’m saying. Those things that were “my” lines or “my” parts, are no longer really mine. Now, suddenly, they are simply something I used to do, something I once did. But anyway, moving on… I am amazed, surprised, and pleased to realize how far I have come. At first, I was hesitant to even be in the voice & movement classes, knowing I was so totally inexperienced and feeling, not necessarily intimidated by individual classmates and their skills and experience, but feeling like I was dragging the class down, or was just in over my head. There were some majorly discouraging and depressing times last term, and while I don’t think there was any point that I was truly genuinely on the verge of actually quitting, there were definitely very difficult times. And then the term came to an end, and I didn’t think I was going to audition. But I auditioned, and I got in, and not only did I get a part that was just the right size for me, but I was also offered dramaturg. And we slogged through rehearsals, and we had a great time. It was grueling at times, it was far too much rehearsal at times, and there were definitely times that I was annoyed, or even I would go so far as to say I was pissed, that we had rehearsal on a given night, when I really wanted to be somewhere else. And I am sure that I had some serious difficulties. But, dress rehearsals came and went, and when opening day came, I wasn’t nervous at all. I went out there and did what I had practiced, as if it had become second nature, essentially. Well, I shouldn’t say that. I still had to consciously think about what my cues were, and such, and sort of prepare myself. And of course I didn’t do it perfectly – it could always have gone better. And I’m still nowhere near thinking I’m able to take on a starring role or anything. But, for what little I had to do, I went and I did it, like it was just something I had to do. Oh, okay, it’s time now to do that thing. One, two, three, done and done. Now I can take a break. What do I feel about the whole production, in the end? Well, in some ways I feel like I expected to feel. I am extremely happy to have done it, to have been involved, to have not missed out. In fact, I enjoyed it so much, I really wish that we could continue having movement class. Maybe this is weird, maybe this is just me, maybe my fellow cast members (i.e. those people who are actual “actors”, in the Theatre dept) would feel totally differently, but in a way I almost feel that the actual performance I could take it or leave it, and that the real skill, the real accomplishment, the real hobby or pursuit is in a longer-term, more regular and routine engagement in learning and practicing, moving and stage combat and all that. Just like a martial artist does not study and practice just for the one tournament, but engages in it on an ongoing basis, so too would I like to engage, on an ongoing basis, in immersing myself, for some time every week, in wearing kimono, and practicing gesturing or walking or fighting like a samurai, or like a courtesan, or like a chônin. So, there’s that. I’m sad to see it culminate and end, rather than continuing on, like a hobby or a pursuit that I can actually continue to pursue, and really identify with and engage in…. And then there’s the question of just how kabuki this is. At the beginning of this school year, and indeed, I guess, towards the end of last school year, whenever it was that I discovered that they were doing the kabuki, I was super super excited to be in a kabuki. What an incredible, awesome, rare, exciting opportunity! As someone who has become (admittedly only in the last few years, but still) an avid fan of kabuki, who has seen a half dozen performances and eagerly would love to see more, I was practically bursting out of my skin at times with enjoyment and excitement at the prospect. But in the end, do I really feel like “omg, I was in a kabuki! I’m going to treasure this for the rest of my life!” Well, not yet. Not right now. Maybe I will later, as nostalgia more firmly sets in. But right now, I feel like I was in a college theatre production, which is still a huge step for me, a new experience, fun and exciting, but I’m not sure it really feels like kabuki. There were times last term, and earlier this term, perhaps, when I felt, for just a moment, like I was really immersed in it, but for whatever reason, being in makeup and costume and wig, being on stage, being backstage, actively engaged in actual performances, devoting my evenings to being there, didn’t really feel like “it” in the way that practice did. Does that make sense? There was something about the practice/training process that felt more like true immersion into a Japanese art than performance did. There was something about the performance (there were a lot of things about the performance) that, I guess, were just too standard, too Western. The fact that it was in English; the ways the stage crew and all of that was run. The way things were ‘flown in’ on wires, and just the whole way things were run, I feel, outside of the relatively traditional methods and materials used in putting on our makeup, in the construction of the wigs, etc., not to mention, of course, the Western audience. … How different would this whole kabuki experience have been if the play were done in Japanese? Or if it culminated in a performance on an actual kabuki stage? Not that I mean to criticize – not at all. I’m just trying to work out my feelings on the matter, and why I might feel a certain way about it. This whole post has been more or less stream of consciousness, and so I apologize for its length, and for its lack of cohesive organization. But, basically, that’s where I’m at right now. Those are my thoughts. I look forward to post-mortem and to the cast party, and am really sad to see it all coming to an end. Many of these people I will remain close friends with and will still see quite often, but, never again will it be quite the same dynamic. There will always be people missing from the equation, people who I was quite friendly with in the course of being castmates, but who I’m not sure I really foresee hanging out with short of bumping into one another… And, even with those friends with whom I remain close, never again will we see each other as frequently as we did this term. Our interactions will be limited pretty much to bumping into one another or making explicit plans. And that’s just how it is. It’s like the sadness of leaving summer camp. The highs of such active social interactions bring concordant lows, making alone time seem so much more lonely in the glow of what came before. I have for the last month or two been serving as dramaturg for the upcoming University of Hawaii Kabuki production “The Vengeful Sword,” which I have been posting about here, and in which I will also be appearing in a very small part, my stage debut. I remain vague on what exactly a dramaturg is or what a dramaturg does, to be honest, and googling the term or looking it up on Wikipedia leads to lengthy discussions and descriptions that lead me to believe that, especially in the Western theatrical mode or tradition, there is a wide range of activities and responsibilities and roles which the dramaturg takes on. But, even so, I am rather enjoying this role, far more so than the standard kind of analysis-heavy, interpretation-heavy scholarship I am used to having to struggle to produce. What I have been doing, and what I have been assured by my colleagues in the Theatre department counts as genuine dramaturgy, has chiefly been to maintain a blog filled with posts about places, names, and objects in the show. I have looked into the history of the Aburaya Teahouse where the play takes place, the actual historical incident upon which it was based, and of the pleasure district of Furuichi within which the Aburaya was located. I have looked into the Aoi Shimosaka sword – an object which plays a major role in the play – that is, into who the swordsmith Shimosaka was, why the sword is called Aoi Shimosaka, and whether there are any other plays or other stories that concern a curse associated with Shimosaka (I haven’t found any); and I looked into what a “certificate of authenticity” for a sword might look like. As one series of exchanges in the play concerns the borrowing (lending) of ten gold pieces, or ten ryô to give the actual Japanese denomination, I recently looked into how much a ryô was worth. How much did it cost to visit a teahouse? How much did a wealthy merchant make, and how much did a low-ranking provincial samurai earn? How much is ten gold pieces to our samurai “hero”, relative to his income and/or to his other expenses? Upon being offered the role of the taikomochi in the play, I also looked into what the term meant, i.e. who the taikomochi were. If I were to continue along this vein, I could certainly look more into all kinds of aspects of the world of the teahouse, how much a kimono or hair ornaments cost, and how much money the courtesans made as opposed to how much went to the teahouse1. I should also like to look into the history of the kiseru, what people smoked (tobacco, not opium, which never caught on in Japan apparently), and how the kiseru might have sometimes been used as a weapon; how tenugui were used, and precisely what style of wearing it has come to be standard signs (on stage, in other media) for a burglar, versus what way of wearing it is the samurai hiding his face (and protecting his hair) while going into a brothel. … One could also look into why it is that the shaved pate became popular (or socially mandatory, really) in Edo period Japan. Lots and lots of things to look into, which help flesh out our understanding of the world in which the play takes place, helping us imagine it better, and helping us act out those roles better. Of course, I don’t presume that I would ever or could ever make a living purely doing this kind of thing for theatre, especially not for Japanese theatre – how many kabuki troupes are there in the US, or even in the Western world as a whole? Certainly, one cannot make a career out of it (well, I’m sure there are troupes or theatres that do have their full-time paid dramaturges, but…). But, just to say that I’ve thoroughly enjoyed being able to flex my historical muscles in this way, to look into a variety of topics, to get at the meat of them, to take all kinds of bits and pieces normally overlooked in broader, more analytical/theoretical discussions of Edo period sociological and cultural developments, and to put them together to produce something which helps me (the historian) and the cast & crew (the readers) to find something interesting, something fun, to learn something more about the world of Edo period Japan, to better understand how certain things were used or what certain terms mean, and to just overall flesh out and expand our knowledge of the setting and our ability to imagine it more fully. After all, that’s what drew me in about history to begin with – the study of history as a means by which to better understand and be able to visualize, imagine, and experience imaginatively the world of the past. I’m not one of those historians who is in it to understand sociological phenomena so as to better understand the present by looking at the past, or to better understand how to address current problems by looking to the past. That is all, of course, very valid and important work. But it’s just not my approach, and this dramaturgy effort has helped me realize more solidly that there is a place for the kind of research that I enjoy doing. I don’t know what I can or will do with this – as I said, I don’t expect that I could ever be a professional dramaturge (least of all in Japanese theatre) as a career – but, even so, it’s just good to get to do it for now. I don’t know when, but I would like in the near future to create some posts for this blog here on the history of the kiseru (smoking pipe) and tenugui, so keep an eye out for those. (1) Memoirs of a Geisha, as well as more serious, academic sources I have read, describe a system by which the girls (though, no, geisha and courtesans are not the same) are essentially indentured servants “owned” via contract by the house, and essentially working to pay out their debt to the house, incurred by the costs of their training, housing, food, clothes, etc.. And this play does discuss customers buying out the contracts of several of the courtesans, so as to ‘free’ them from the teahouse and take them home to be their wives. Yet, still, the play also talks of individual courtesans selling their hair ornaments and kimono to raise money to lend to a customer who requested it, and of another courtesan who seems to express the ability to choose of her own will who she will and will not marry. Cecilia Segawa Seigle, in her book Yoshiwara, discusses briefly how much teahouse staff made in tips. So, obviously, not all the money was going straight to the teahouse. I would definitely be curious to learn more about this, and am eager to read through Seigle’s book. It has been a long time since I have posted about our upcoming kabuki performance here at the University of Hawaii, and about my training and rehearsal process. I guess this was in large part because I was nervous/hesitant about representing it correctly, accurately. It’s a delicate line between what counts as genuine kabuki or not, and just sort of how to conceive of a student production such as this. Such issues have come up before on this blog, and I have never really had the words to navigate or negotiate the subject properly. Plus, our director had specifically requested that we refrain from posting photos of rehearsals, or other materials, online, mainly so as to avoid misunderstandings in which high schoolers, or anyone else, using the Internet for research, mistakes what we’re doing for the professional, genuine, full-on real thing. As dramaturge, as someone who is going to be giving a pre-show talk on April 23, I suppose I ought to learn how to talk about this, but for now I have yet to really gain the skill to properly tiptoe around this subject, and to frame the project in the way Dr Iezzi wishes us to. In any case, it is kind of amazing to look back and look at how things have changed over the many months. Back in the Fall, there were many times when Voice & Movement class seemed too much, seemed a nuisance and a source of excessive stress when I was trying to focus on my other classes, and to do kabuki just for fun, just on the side. I grew frustrated with the sensei easily, as they tried to get me to talk louder (I didn’t think I could), or to emulate melodies or otherwise modulate the pitch of my voice in a more controlled manner, or to move a certain way which I didn’t think I could. Some of that still goes on. And though this Spring term started out with its fair share of frustrations, too, mainly over the fact that rehearsals were so often scheduled so as to conflict with other things I wanted or needed to go to, I am somewhat surprised to realize just how much my attitude and view has changed over the course of this term. Granted, rehearsal continues to conflict with major events that I would otherwise be very very very much wanting to attend, including a huge major conference that I have been looking forward to ever since I first heard I was accepted to UH, before even coming here. But, all in all, rehearsal has come to be, well, if not relaxing per se, if not amazingly fun every moment of the time, it has come to be normal, and natural. When I don’t have rehearsal, as I didn’t this past Saturday, I feel weird and out of place; I panic that I’ve forgotten and was supposed to be there after all. I have lots of work to do for other classes, and yet every moment outside of rehearsal I feel lost and directionless, like my days truly fully center around rehearsal, and everything else is just downtime. I’ve been sleeping a lot, and dicking around a lot (like I’m doing right now, writing a blog post instead of a term paper). I just can’t seem to get motivated to focus on my other classes. The shoe is on the other foot, I guess, if that’s a correct usage of that phrase. Now it is kabuki which seems the chief thing in my life, and other classes which seem the bothersome obstacle. I still get “notes”, meaning suggestions, critique, criticism, direction from the sensei, and I feel far from perfect in my performance, but more than anything it feels like an after-school club – like the place I go to do something different, challenge myself, have fun, while hanging out with friends. It’s not “easy” as in easily done, easily done better, easily done perfectly, when I’m trying to follow sensei’s choreography directions, or when I’m trying to sit seiza for upwards of 30 mins straight without my feet going completely numb. But I have completely gotten over the stressfulness of not being good enough, or whatever. Rehearsal isn’t stressful anymore. How about that? If there is one thing I have learned from this whole experience, it is how to deal with failure and incompetence. Someone once pointed out to me when I was in high school that I was essentially a know-it-all, and that I got really hurt, and defensive, when I was called on in class and got an answer wrong. That’s still true. I’m still something of a know-it-all, and I really really struggled at the beginning of this school year with thinking that I ought to be able to do better at this, that I ought to be able to pick it up quickly, and just being extremely frustrated with myself that I wasn’t better at this – at voice, at movement – and I took it out on the sensei and on the whole thing, calling it too hard. I talked back a lot, apologized a lot to those students who I felt I was holding back or being a nuisance for, or whatever, and I was severely demoralized at times. But, no longer. If there is one thing I’ve gotten out of all of this, it is the ability to fail, and fail completely, and just say, okay, we’ll try it again tomorrow. That’s the nice thing about rehearsal, so long as it goes on forever. I am trying my best to ignore the idea that there’s a deadline by which we have to actually have it down, that there are real performances coming up in which we need to do it right and there are no second chances. I’m trying to ignore that and just focus on the idea of rehearsals, of there always being tomorrow to try it again and to get better. Yesterday we did our makeup for the first time. I have never put on makeup in any way; I have never painted my face for Halloween; I’ve barely ever even painted on paper (well, since middle school art class or whatever). The whole experience was basically a total mess. Well, no, I shouldn’t say that. It was just a very new experience, new enough that I felt I could not even pick up the brush, for want of understanding what to do with it. You want it to go so perfectly, even the first time. You want to think, “oh, that was easy. that went well. I really can do this.” But, no. You look around and you see others whose makeup looks quite good, and who aren’t hesitating the way you are at every step of the way (how do I hold the brush? how much of this red should I have on my finger so that it won’t be too much when I dab it on? ), and you think, “wow. I really am more clueless than other people. I really am worse at this. I really am doing a poor job of trying it out, going for it, jumping in headfirst.” And you go ahead, and try to do it, and it comes out a mess. My white wasn’t thick enough, and so I tried to put more on, but was being hesitant and conservative. I don’t know how much I need. What do I know? And I tried to put on the red corners of my eye, and as soon as the brush touched my face, ever so lightly, in the wrong place, boom, now I’ve got a really noticeable red spot in the wrong place. Can’t cover it up. Can’t blend it down without creating a huge splotch of pink all over the place. So I decided to call it done for the day, and to just take it all off. I felt a sense of failure, sure. But I was perfectly ready and happy to just put it aside, and give it another try another day. Which I will do tomorrow. In the meantime, today, I’m not demoralized over it; I’m not thinking about dropping out of the play or anything. More rehearsal today, of course. Sitting went amazingly well yesterday. I’ve been nervous and scared ever since last Monday, when my feet went numb under me, and when I stood up, I crumpled and fell over, multiple times. That cannot happen during an actual performance. So, what to do!? But, maybe just by luck, I don’t know, I did much better yesterday, no numbness at all from my feet falling asleep. I managed to keep them awake the whole time. And I think once we get tatami, rather than sitting on the stone hard floor, it’ll be easier still. I’ve also gotten contacts, and have gotten used to wearing them surprisingly quickly. So now I don’t have to worry about being blind onstage. Woo! Little by little it’s all coming together. This post is starting to get quite long. But there’s one more main thing I wanted to think about, and to talk about, which is what this whole production means to me. Maybe in a few weeks, when the actual performances or going on, or in a few months after it’s over, I’ll feel different, but right now, there’s sort of this weird feeling in that, yes, I’m quite happy and content and glad I’m doing this. I’m having fun, I’m hanging out with awesome people, I’m challenging myself in a productive sort of way and growing as a person or whatever, having new experiences… But that feeling of really genuinely being in a kabuki just isn’t there. If you told me a year or two or three ago that I would ever actually be in a kabuki, I would be so super excited I might explode. There were times last term, in between the more depressed and demoralized times, that I was truly ecstatic. And now, well, I don’t know. Maybe it’s just because it’s gotten to be so familiar, because I know the people involved so well and all that, but it really feels much more like our thing, some little (well, not little) thing that we are putting together here, and not like some huge super special super impressive production that one should be willing to give up their right arm to be in. … I guess, to some extent, all endeavors feel that way.